Rain, snow, ice-covered sidewalks, and dangerously high or low temperatures have one thing in common: they all tend to leave the entire family stuck indoors. During these times, life can get really boring more so if you are out of ideas on activities that can help burn pent up energy. And, hey no! Plopping on the couch as you binge on Netflix won’t. Actually, it’s unhealthy. But an indoor trampoline will. An indoor trampoline is much smaller than the gargantuan models that live in backyards. But the best of these models are designed to offer tons of fun while keeping the whole family fit and active all day long. Whether you are looking for a kids’ indoor trampoline or you want a mini trampoline for adults, here are our best recommendations for 2019. Mini trampoline or rebounder- what’s the difference? It’s not so hard to see why this mini trampoline for kids has received such an impressive rating from previous users. The Merax has a diameter of 36 inches and a total height of 31.5 inches from the floor to the peak of the handlebar. It is fitted with a strong polypropylene mat that, unlike most of the recent models, is attached to the frame using stainless metal springs. The spring system is covered with a cheerful light blue pad that feels impressively sturdy and we expect it to last quite a long time if the tramp is used indoors. What makes the Merax 36’’ the best indoor trampoline for sale is that it can be used by both kids and adults. The wide handlebar is set at around 24 inches from the jumping mat and offers somewhere for your kids to latch on. Interestingly, this handlebar can be detached to convert the Merax into an indoor trampoline for adults. However, keep in mind that it has a weight limit of 180 pounds. So, while you can have a ride once in a while, you might want something stronger such as the Jumpsport 350 reviewed in this article. Our runners-up model in this list of indoors trampolines is from a brand that is already commonplace in most households; Little Tikes. The Little Tikes 3’ is currently the most popular indoor trampoline for kids with reviews running in their thousands. The manufacturer recommends this energy burner for kids between 3 and 6 years and weighing 55 pounds and below. How big is this mini trampoline? This mini indoor trampoline has a diameter of 36 inches and a height of 33.50’’. The handlebar has a height of 26.25’’ from the jumping surface. Generally, these dimensions make the Little Tikes 3’ just the right size for little jumpers. Compared to the Merax 36’’ above, what we like about the Little Tikes is that the handlebar is set at the center of the frame. We find this practical since kids want to walk around the mat and even hang on the handlebar and still feel safe. Uniquely, the Little Tikes uses elastic webbing that is much more durable than cords and a lot safer than springs. In addition, this mini trampoline comes semi-assembled. All you do is attach the legs and snap on the non-slip feet- an easy process that will take you 15-20 minutes. This hexagonal-shaped mini trampoline is 84’’ wide and has a height of approx. 74 inches with the netting enclosure. The frame is made from heavy-duty rust-resistant galvanized steel for durability and to support up to 100 pounds. The legs, on the other hand, have wide plastic caps for added stability. The Sportspower My First Trampoline is spring-based and has a really good bounce. The springs have a decent amount of padding and the net and mat have been UV-treated for durability. The Original Toy Company Fold and Go trampoline is just as its name suggests; you simply unfold, screw on the legs, mount the handle and let your kid bounce their way to fitness. The process of assembling and disassembling this mini trampoline shouldn’t take you more than 10 minutes (the manufacturer says 5 minutes). You’ll find this very practical especially if you have to fold it for storage after use and set it up once again when it’s time to jump again which can be upwards of 3x a day. The Original Toy Company trampoline is 36 inches in diameter and it’s recommended for kids weighing up to 150 pounds. Boasting a heavy-duty steel frame and sturdily welded arched legs to prevent tipping over, the Jumpsport 350 is our top pick for the best indoor exercise trampoline for adults. This rebounder offers a jumping surface area of 510 sq. in. on the mat, and a total of 915 sq. in. of workout area with the skirt. The 350 is marketed to both novice and experienced trampoline users. It uses 30 bungee cords that are rated at 800K bounce cycles and has a weight limit of 275 pounds. Depending on your experience or exercise needs, you can adjust the firmness of the cords in 3 levels. This also makes it a great tramp for multiple users. Available in 3 cheerful colors- red, green, and blue– the Skywalker Trampolines Seaside is, in our opinion, the safest indoor trampoline for kids. This trampoline indoor is recommended for children of ages 3 to 7 and below 100 pounds. It measures 60’’ by 60’’ by 63’’ (H) and weighs 27.3 pounds. Besides its kid-friendly color designs, what we love most is the number of safety features that Skywalker has put in it. First, the Seaside Bouncer uses bungee cords not springs for your kid’s safety. Second, the netting enclosure attaches directly to the mat to keep the jumpers off the edges to prevent tipping over and it’s very high. There’s also a 360-degree padded support bar for stability, an unforgettable doorway, and a net that keeps other toddlers from crawling under the bouncer. If you feel that the Jumpsport 350 that we reviewed earlier is a little bit pricier for your exercise needs, the Leaps and Rebounds bungee rebounder might be a cheaper alternative. This model comes in 2 sizes (40’’ and 48’’) each with a weight limit of 250 pounds. The frame and legs of this mini indoor trampoline are made of carbon steel that makes the rig strong and sturdy but also light for those moments when you’ll want to move the rebounder. Worth noting, this model has screw-in legs, and that’s to say that you can disassemble it completely for easy storage or transportation. Even at its already low price, the Leaps and Rebounds is shipped to you free and it comes with a 30-day satisfaction or money-back guarantee. And if you buy it, you get a lifetime warranty. The Wamkos 36’’ Mini Kids Trampoline is relatively new in the market but it’s already creating a really good buzz among its current users. This model is a great go-to gift for kids with an intense flirtation with dinosaurs. It is recommended for toddlers of age 3 and up and has an amazingly high weight limit of 220 pounds (100kgs) which is the highest in this list. The Wamko has a diameter of 36 inches and a height of 9’’ from the ground which makes it easy for pretty much most 3+-year-olds to access. It uses springs and has a good but safe amount of bounce and the springs have been diligently covered by the dinosaur cover and a pad for safety. What you’ll really love about this indoor trampoline for toddler is that it’s foldable for storage and easy transportation. The Pure Fun Super Jumper is yet another affordable model and an excellent choice for those looking for a cheap indoor trampoline for kids. This is the largest mini trampoline in this list maxing out at 48 inches and has been built just like a full-size tramp only that it is meant purposely for kids. The manufacturer recommends it for kids between 3 and 10 years and not exceeding 100 pounds in weight. Its construction consists of a heavy-duty steel frame and a polyethylene net that attaches to the mat via 42 3.5’’ springs. For the jumpers’ safety, the spring system has been covered with a nicely-designed cover that also adds charm to the tramp. There’s also a 35’’ ergonomic padded handrail that has been thoughtfully curved for added stability. 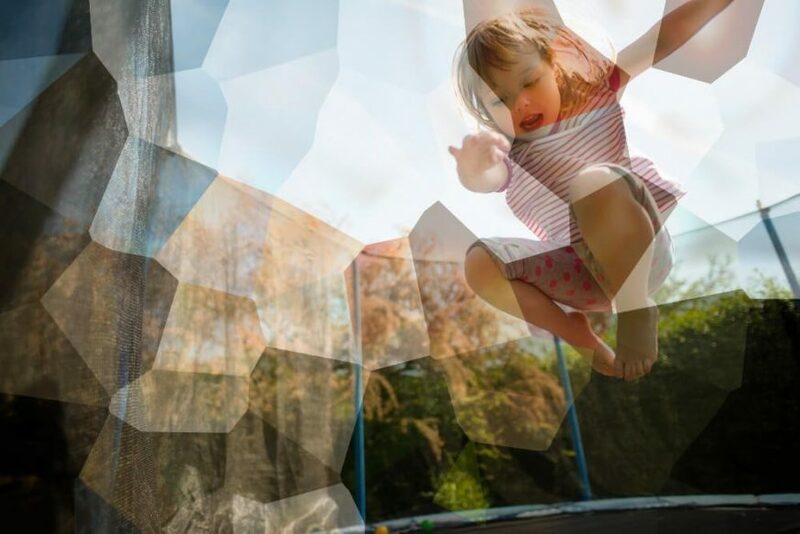 Our last recommendation for the best children’s indoor trampolines has been cleverly crafted to allow both outdoor and indoor use. The materials used for the net, mat, and spring system padding are UV- and water-resistant thereby assuring you that the EnjoyShop 7’ will remain in great condition when used both indoor and outdoor. Considering its ease of moving, though, I would recommend using it indoors all through to prolong its lifetime. There’s no doubting that jumping on a trampoline has tons of benefits both for the kids and adults. Jumping on a trampoline offers a great whole-body workout that boosts your heart rate and strengthens your muscles besides helping you deal with stress. For kids, simply jumping on a tramp helps in boosting their balance and coordination and also helps them to be persistent. This improvement is noticeable even in their class performance over time. Like everything else, though, there’s nothing like the best indoor trampoline for everybody. This is why any model, regardless of the price and sophistication, has its share of positive and negative feedback from its previous users. While these 2 names are commonly interchanged and used to mean the same thing, a mini trampoline is just that… a small trampoline that in most instances comes with an enclosure system and it’s generally meant for kids. The Sportpower My First Trampoline, the Skywalker Trampolines Mini Bouncer, and the Giantex 7′ Trampoline are good examples here. The main advantage that these models offer is their advanced safety levels. Most kids also seem to get attached so easily since these models are similar to an adult-size trampoline in design and functionality. A rebounder, on the other hand, is more or less a mini trampoline minus the enclosure system. These models are great for exercise and are actually known as exercise trampolines. Depending on the model and brand, a rebounder may use either bungee cords or springs. Bungee cords are slowly becoming more popular since they are quieter and much safer. The only issue is that replacing them might prove very expensive in the long run. Spring rebounders offer a better bounce and are relatively cheaper. On the downside, they are squeaky and noisy and might rattle the entire household when you decide to jump on the tramp during odd hours. The size of the trampoline will depend on the intended user and the type of exercises that you’ll be engaging in. All in all, you want a model that offers enough workout surface if you are buying a mini trampoline for exercise for adults. For kids, the mini-trampoline should allow them to move and jump safely without the fear of falling off the mat. Consider the type and quality of the materials used for the tramp ranging from the frame to the mat, springs, and enclosure (if there’s one). Indoor trampolines use either welded or screw-in legs. The former tend to be the most popular since they are the sturdiest. Screw-in legs, on the other hand, have the upper hand in terms of storage since they are easy to disassemble for compact storage. Of course, you don’t want a tramp that puts your wellbeing and that of your kids at risk. Consider the safety features that the manufacturer has put in place to guarantee the users’ safety. Depending on the type of tramp and the intended user, these features may include a safety enclosure, arched legs, a padded spring/bungee cord system, and a handlebar. An indoor trampoline is a great way to burn off some energy indoors when the weather won’t allow you to do it outside. Most of these models are much more affordable than their full-size alternatives yet they pack a lot of fun and great health benefits.